Like us on Facebook to keep ahead of all special offers and announcements. Nestled behind the sweeping curve of our own private sandy beach, Sandgreen Caravan Park is an idyllic, peaceful and secure location in which to enjoy the relaxation and freedom of owning your own holiday home. Our carefully designed holiday park is within 2 hours of much of central Scotland and the north of England. Enjoy a peaceful holiday in a natural environment surrounded by wildlife, right in the heart of one of Scotland’s official National Scenic Areas. 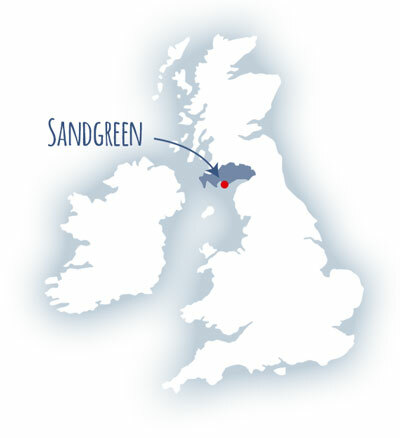 Located on the stunning Solway coast, just a few miles from the A75 and the picturesque towns of Kirkcudbright and Castle Douglas; Sandgreen provides all the pleasure of a coastal escape with the convenience of being just a short drive from the A75. Sandgreen is closer than you think! Book an appointment to explore your options. Or why not book a short break in one of our three luxury rental Static Caravan units or our stunning 3 bed timber lodge? If you fall in love with Sandgreen and decide to buy your own holiday home here (from our stock), we’ll fully refund the cost of your holiday!